Perennial herb 0.4 - 0.8 m long Stem: strongly viny and twining (rarely decumbent or erect), finely hairy or almost hairless. If the stem is broken or cut, it exudes milky sap (latex). Leaves: opposite, short-stalked (stalks 1 - 1.5 cm), non-toothed, 5 - 7 cm long, 2 - 3 cm wide, egg-shaped (though lower leaves often more rounded), with long-tapering tip, a rounded or slightly indented base, and hairy veins and edges. Flowers: five to seven, in short-stalked (stalk 0.5 - 1 cm), branched clusters at nodes, but not in the leaf axils. The small (6 - 8 mm diameter), very fragrant, dark purple, radially symmetric, almost bell-shaped flowers have a short ring of extra appendages between the petals and stamens called a crown or corona. Sepals: five, but fused at very base, then separating into spreading or ascending, egg-shaped lobes. Petals: five, but fused into a very short tube, then separating into spreading, short (1.5 - 3.5 mm long), broad, egg-shaped lobes with straight hairs on the inner surface. Stamens: five, but fused into a short sheath around the style, with the bases attached to both the petal tube and crown. The anthers are fused in a ring and attached to the stigma, and have prominent, erect or inward flexed, papery, slightly toothed appendages at their tips. Pollen sacs (two per anther) each contain a single, hanging, oblong, waxy pollen-mass (pollinium). Pistil: with two, superior ovaries, each with one style, but then the styles uniting to form a common, thickened style-head at the top, with stigmatic regions along the sides and between the anthers. Fruit: a single-chambered, 4.5 - 8 cm long, slender, narrowly spindle-shaped (narrowed at both ends), smooth, hairless pod (follicle), which opens along a suture running down one side. 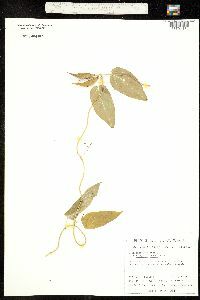 Seeds: numerous, flattened, with a tuft of long silky hairs (coma). Similar species: This is the only species of Vincetoxicum in the Chicago Region. 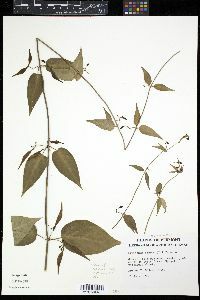 At least one other species has been reported in eastern North America, V. hirundinaria, but that species has paler flowers, longer petal lobes (2.5 - 4.5 mm long), and hairless petals. 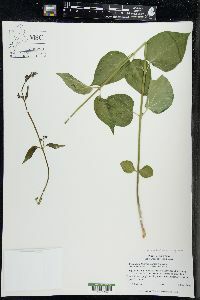 In the Chicago Region, V. nigrum could probably be confused with Ampelamus laevis, but that species has white flowers, larger flower clusters on longer stalks (inflorescence stalks up to 5 cm long), longer leaf stalks (up to 8 cm), and distinctly heart-shaped leaves with very indented bases with a large space between the rounded lobes. Habitat and ecology: Occasional as a weed growing along fences or in hedges, thus far fairly contained to disturbed habitats in the Chicago Region. Notes: This species was introduced from temperate Eurasia, and can become very invasive, though it is still confined to disturbed habitats in the Chicago Region. Members of this genus are sometimes included in the genus Cynanchum, then this species is known as C. nigrum.